War in the casinos is a 2 player game just like the kid’s game. In the kids game the object is to win all the other players cards, in the casino version it is to win money and not cards. In the children’s version of the game a full deck of cards is split evenly between the 2 players. The without looking at the cards both players flip over the top card and the one with the highest card value wins and gets to keep both cards, if both players turn over there cards and the values are the same a War is declared. Each player will put 2 cards face down and flip the third card and the winner gets all the cards, including the 2 original cards. The game is one when 1 player holds the entire deck of cards. In the casino war most of the rules remain the same The object in the casino version of this game is not to get all the cards, but to win money. A deck of cards is not split between the players, the dealer has a shoe with 6 decks of cards, and the dealer gives out the cards 1 round at a time. In the casino version of war a bet is placed by the player before the round even begins. After the bet is made the dealer will deal 2 cards face up. On card is for the player and one is for the dealer. If the player wins he gets paid 1 to 1. if the dealer flips over 2 cards of equal value the player has the option to keep half his money and a new round can begin or he can declare a war. 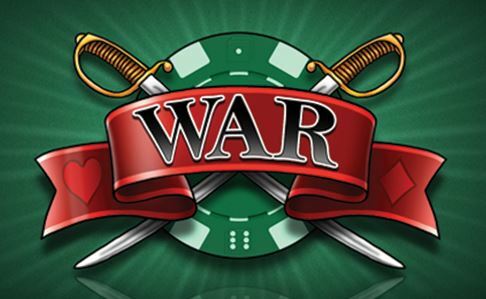 If war is declared the player may up his bet then dealer will remove 3 cards from the shoe and flip over the next 2 cards. If the player wins he gets paid on both bets and if he looses the dealer takes it all.